Shrek is making way for Kung Fu Panda at Universal Studios Hollywood. In 2018, the Shrek 4-D theater will be transformed into Dreamworks Theatre. 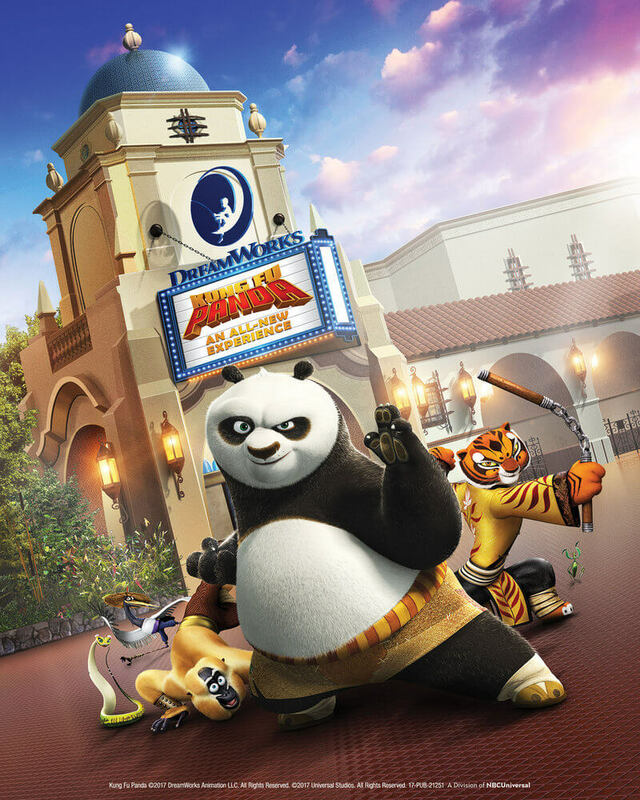 The new venue will host a variety of Dreamworks-themed attractions, kicking off with Kung Fu Panda. The ride takes guests on a journey through storytelling and state-of-the-art projection mapping and LED lighting effects. Take a look at the concept art for the exterior of the new Dreamworks Theatre below. Dreamworks characters will be making appearances in the parks starting in summer 2017. Newly introduced characters will include: Kung Fu Panda’s Po and Tigress; Madagascar’s Alex the Lion, The Penguins—Skipper, Rico, Kowalski and Private, and King Julian; Trolls’ Poppy and Branch; and Shrek’s Puss ‘n Boots will join existing characters Shrek and Fiona. Hello Kitty is also joining Universal Hollywood in 2018. Hello Kitty and friends will appear on exclusive park merchandise and Hello Kitty herself will make in-park appearances. Hello Kitty is already at Universal Orlando. She appears in a meet-and-greet in the video below. There are also some exciting recent additions at CityWalk. Steven Speilberg was on hand for the grand opening of Universal Cinema, a state-of-the-art venue with screening room quality theaters, deluxe reclining seats, and more. New restaurants include Jimmy Buffet’s Margaritaville, Voodoo Doughnut, and Dongpo Kitchen. Stay tuned for more exciting updates about the new attractions coming to Universal Studios Hollywood. Older Older post: Lost Theme Parks: Freedomland U.S.A. – Baychester N.Y.